Gary Renner (Left) and Bill White (circa 1983). I can't find the link to this Leader-Post Article that was from back in 2008 about Gary and Bill. The Article was titled Always Knowing The Score by Braden Husdal that was published September 18, 2008. Gary Renner and Bill White have seen it all in their 40 years as a scorekeeper and timekeeper for the Regina Pats. A different arena, different coaches and different players are all changes Renner and White have experienced since they began the positions they still hold. 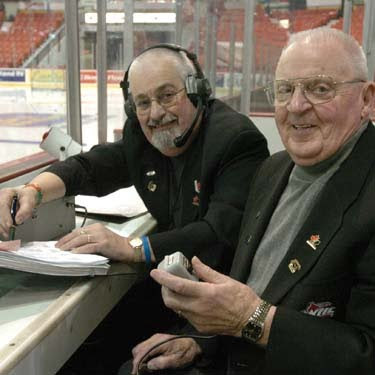 World junior championships, NHL preseason games and Memorial Cups have also been viewed by the two stalwarts and they wouldn't have it any other way. "There are so many moments and comical experiences that I've been a part of in my time in the position," said Renner, the Pats timekeeper since 1968. "It's so hard to lay a finger on one that stands out more than any other because if I did that I wouldn't be doing justice to another moment that I can't remember right now. "I've met so many great people through this job that I can go up to and have a conversation with about a fond memory. If I have to single out one thing then I would say that the people are the best part." Renner and White are an integral part of the Pats game-day operations. Responsibility for keeping proper time and keeping straight goals, assists and penalties is something that neither man takes lightly. Renner arrives approximately two hours before each game to ensure the score sheet is in order while White arrives about an hour early to work the clock for team warmups. Their positions enable them to interact with coaches, players and officials on an almost nightly basis. That interaction has helped form some relationships that both fondly remember. "One of my favourite players was Garth Butcher, who played in the early '80s," said White of the former Pats defenceman. "We saw him in the penalty box on a regular basis and he always had something funny to say. "One time Garth and a guy from another team were both in the box after getting penalties and they started talking to one another. The guy from Calgary asked Garth, 'Why wouldn't you fight me tonight, Butcher?' Garth answered back, 'The coach told me not to, but if there would've been a real hockey player out there I would have fought him.' I thought that that was pretty good." White has been with the Pats organization since 1969 when he was a part-time official. Eventually he moved to scorekeeper for the Pat Blues SJHL team and then to timekeeper for the Pats. He has been working with Renner ever since. White and Renner are both big fans of the Pats and hockey in general but while the game is on they maintain their professionalism. "Deep down inside I'm always cheering for the Pats but I try to never show that when the game is on," said White. "It's important to myself as well as the coaches and the referees that I'm impartial. "I've never had anyone upset at me about the clock because the referees are always watching it too. If there's ever a question if too many seconds went by before I stopped it then they'll come over and we always manage to get things straightened out." Renner and White have no plans on stepping down from their positions anytime soon. Renner is 62 and White is 80, but they maintain that as long as they remain healthy, they'll continue. This is how most fans will remember Gary and Bill. The Pats honoured Gary and Bill in 2014 as Pats Builders for their years of volunteering for the Pats organization. 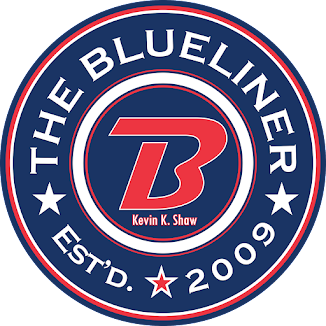 Regina, Saskatchewan – The Regina Pats Hockey Club is pleased to announce the team has honoured four long time volunteers as “Builders” of the team. Off-ice Officials Gary Renner and Bill White along with Dr. Ian Hill and Dr. Ralph Berdan join current Builders Graham Tuer, Lorne Davis, Bob Turner, Del Wilson, Gord Staseson and Al Ritchie. 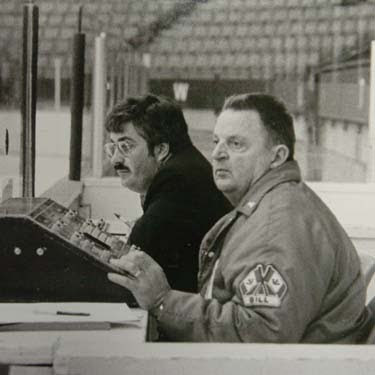 As off-ice officials, Garry Renner and Bill white were key parts of Pats game nights, ensuring accurate scorekeeping and timekeeping throughout Pats games. Renner was a member of the Pats’ off-ice officials for 44 years while White volunteered for 42 years. Dr. Ian Hill served as the Pats’ team doctor for 45 years before retiring last season while Dr. Ralph Berdan will end his time as the team dentist at the conclusion of this season after 35 years with the Pats. Tonight the Pats also honoured Dyson Stevenson, Boston Leier, Jesse Zgraggen and Logan McVeigh for the milestone of playing 250 games in their WHL careers. Gary Donald Renner, late of Regina, SK passed away on Friday, August 5, 2016 at the age of 70. Gary was born on April 22, 1946. Gary was predeceased by father Ed; and his mother Alvina. Lovingly remembered and left to cherish his memory are his wife Pat of 41 years; daughter Carrie (Max) Bowen and their children (Peyton and Lexi); son Scott Renner; sister Gayle (Elwood) Zolc; sister-in-law Helen (Doug) Adams; along with numerous nieces, nephews and close friends. We, Gary’s family would like to thank the staff at the Regina General Hospital ER and CCU for the care they provided. A MEMORIAL SERVICE will be held at Trinity Evangelical Lutheran Church, 1909 Ottawa Street, Regina, SK, on Wednesday, August 10, 2016 at 1:30 p.m. Flowers are gratefully declined. Donations in memory of Gary may be made to the Canadian Diabetes Association, 917A Albert Street, Regina, SK S4R 2P6. I grew up going to every Pats games and i would run around down stairs during games. Gary and Bill were the nicest guys. Then i was lucky enough to spend 4 years in the WHL and a good bit of time was spent in the box with those guys. They would heckle me every time. Sad news about Gary.